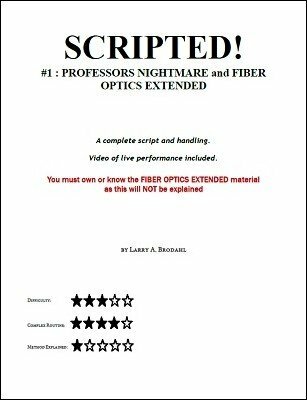 A script and performance video showing how the Professors Nightmare and Fiber Optics can make a fun and mystifying routine. One of the more difficult tasks facing magicians is coming up with scripts - of any sort. But it's even harder for tricks that have no preset routine - such as the Professors Nightmare and Fiber Optics. How do you explain to an audience in a reasonable manner how and why this fabulous visual magic is happening? Please note that this manuscript DOES NOT teach how to do any of the moves. It is assumed that you know these tricks. This ebook and the video of a live performance gives you every line, joke, piece of timing, setup and nuance of the routine. The ebook also takes you through the steps of script writing used to create this five minute routine of purely visual, understandable, and fun magic. With minimal alterations, which are also explained, the routine has been performed for audiences of all types.